Rachel has a background in Biotechnology and Immunology/Infectious Diseases, and earned a PhD in Cellular and Molecular Pathology. She also spent a year learning the ins and outs of a clinical diagnostics lab. Currently, Rachel works at an FDA-regulated quality control lab where she researches how to implement new analytical tests using the most cost-effective methods. She also performs routine microbiological testing for clients. And paperwork. Lots of paperwork. In her spare time, she plays with her pet parakeet, composes classical/electronic music and writes blog articles as well as science fiction novels for young adults. You should listen to music on her website, check out her blog, and follow her on Twitter. Picture this – a somewhat dim, blue fluorescent-lit lab, the scrubbed benches full of neat rectangular machines with blinking lights. Maybe off to the side, a computer hums quietly. A scientist in a pristine white coat barely even has to look through the fridge before plucking the panacea for the latest plague from its shelf. You might be treated to a rack of test tubes tossed off-handedly (but still neatly) on the bench top. 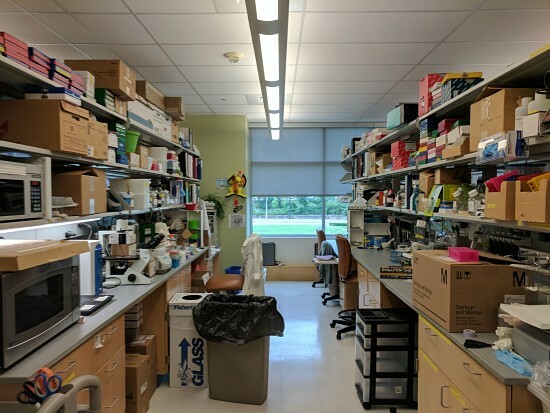 The surrounding shelves, if there are any, contain stacked boxes and wire racks that somehow manage to fit everything a scientist might need inside. Also, almost everything is white—the floor, ceiling, walls, tables and drawers—you name it (lookin’ at you, Jurassic Park). 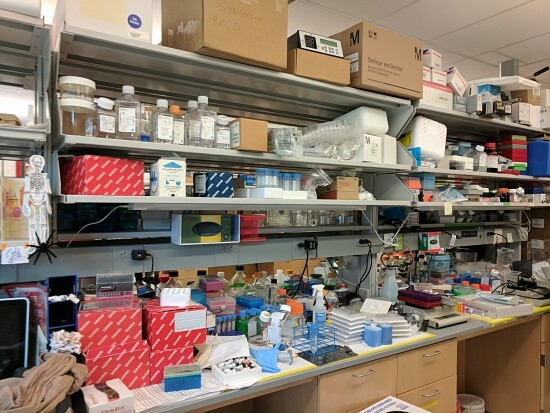 If any of that sounds familiar, it might be because you’ve seen such labs in the Resident Evil franchise, Deus Ex games, and movies like Avatar (cue all the scientists screaming over the way Sigourney Weaver uses her pipette). Chances are, people probably imagine labs this way because it looks cool and futuristic, but may not be terribly practical. The reality is, the manager from my graduate lab might have died of happiness if our lab ever actually looked like that. Even after Lab Cleaning Day (an all-day event), our work benches were still stacked high with pipette tip boxes with wires going absolutely everywhere, shelves stacked full of stuff we were sure we’d need one day (like years-old samples, expired chemicals, empty Styrofoam containers and cardboard boxes with outdated equipment and textbooks/papers from decades ago). Pipettes (tools for measuring out/transporting liquid volumes) might hang from their hooks for a week, but they’ll eventually walk off somewhere again. But on a regular day, this is what the lab looks like. Or, at least, this is what my graduate lab (an orthopedics/tissue engineering lab) looked like. In addition to the mess, please also note the brightness of the lab. Hollywood might have the viewer believe that scientists work in the dark all day, but this is the typical light setting of a real lab. There are some exceptions where the lights should be dimmed/off (i.e. maybe if your character is doing stuff like fluorescent microscopy or developing autoradiography film), but the work area should be well-lit so people can see what they’re doing. There is also a general lack of chrome and glass surfaces across the board. Also, almost nothing is white. That’s not to say you can’t have white drawers, but it’s a little much if it’s paired with white tiles, microscopes and light fixtures. Fridges/freezers tend to have a rather higgledy-piggledy arrangement, especially if multiple people are sharing and have to Tetris stuff to fit in their given spaces. Which means generally, even if someone knows exactly where the Thing is, they’ll have to play archeologist for a bit just to unearth it. Equipment can be new(ish), assuming the lab in question has hoards of funding, but they don’t blink lights simply for aesthetics. Every light and knob and display has a purpose. Every machine should be carefully calibrated to perform specific functions. Most modern analytical instruments will come with a computer hooked up to it, too. And of course, all the equipment should be appropriate for the scientists’ tasks. That’s one thing movies tend to get wrong, too—putting inappropriate or inadequate equipment in the lab for the type of work being done, i.e. how Oscorp Industries in The Amazing Spider Man essentially works with cells and genetics, but doesn’t have visible signs of PCR machines, biosafety cabinets and gel electrophoresis units, and keeps a dim, blue-lit room full of spiders with no food. One thing the machines are definitely not, however, is quiet. Sci-fi movies might have you believe labs are quiet places with stoic and silent workers, but in reality, labs are loud. Not only do you have someone laughing in the next aisle while you and your coworker animatedly recount every moment of last night’s Game of Thrones episode (not gonna lie, happened every week the show was on), you have all the equipment running, and they all produce some variant of whooshing, humming, buzzing or whirring. The air flow in biosafety cabinets is noisy. Something is always beeping. Always. The fridges are always working to keep reagents cool because people are constantly opening the doors. Autoclaves hiss and clank. People slam doors, incubators, fridges and freezers. Timers go off all the time (and stay on, because the person probably forgot about it). No one turns their computer off, ever. Centrifuges whir (and they can make horrible womping noises if they’re unbalanced). My orthopedics lab also had a cryogenic pulverizer, and when in use, it sounded like massive, heavy-duty steel maracas. And, with all the equipment that shouldn’t overheat, the AC’s always blasting away. Even in winter. 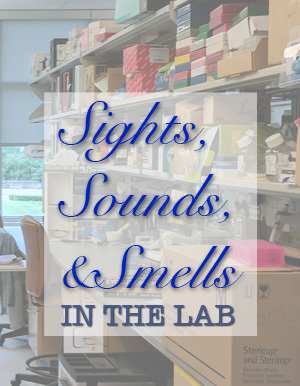 I’ve found smell is a sense often overlooked in science lab descriptions. People rarely wrinkle their noses, keep a bottle of Febreeze handy, or have to step outside for fresh air. Tissue engineering and molecular genetics labs will likely be on the mild side. Broth media used to culture cells can smell like diluted Gatorade. The worst it might get is if someone breaks open a tube of beta-mercaptoethanol (BME), which has the odor of something like rotten eggs mixed with rubber. This stuff is potent, too. The bottle only needs to be open for a few seconds to get a whiff, but the smell would linger for at least 10-15 minutes. And if someone accidently broke a bottle, it’d be time to pack up and go home. No one would be getting any work done after that. The most pungent and memorable aromas I’ve found are when we’re autoclaving biohazard waste (cue the inevitable cheerios-boiled-in-chicken-broth smell) or when someone’s washing glassware (ripe raw sewage or stinky feet smells). Reminds me of my basement office. Then again I’m a chemist.